Here at i3 Detroit, we’re knee-deep in the process of applying for our federal 501(c)(3) tax exempt status. In other words, we’re working on making our non-profit status official, with all the benefits that entails. We’ve learned a lot so far, and thought it might be helpful to other hackerspaces that are thinking about going the non-profit route. And so we proudly present the first installment in our new Hacker Business Series, Non-Profit Basics. Obligatory disclaimer: although we have done our best to ensure the accuracy of the information in this article, we are not law or tax professionals. Please consult with a lawyer or accountant specializing in non-profits before making any important organizational or tax decisions! What exactly is a non-profit? Let’s start by clearing up what exactly it means to be a non-profit. It’s a common misconception that non-profits are organizations that are not allowed to make a profit. In fact, non-profits can (and hopefully do) make a profit! What actually defines a non-profit is that the profits cannot go to any individual owners or shareholders. They can however pay reasonable salaries to their officers and employees. There are several kinds of non-profits, but in the US, the standard is the 501(c)(3) public charity. 501(c)(3) is a section of the IRS code that describes one type of charitable organization that doesn’t need to pay income taxes. But wait! There’s more! 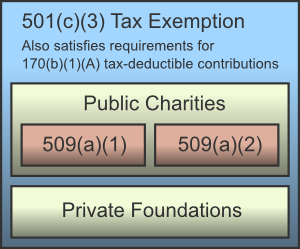 If your group meets the requirements for 501(c)(3), you automatically meet the requirements for another section of IRS code, 170(b)(1)(A), which says that if an individual or business makes a charitable donation to your organization, they can claim it as a deduction on their income taxes. Within 501(c)(3) there are two types of organizations: private foundations, and public charities. Private foundations are more restricted and have higher record-keeping burdens, so organizations like to be public charities if at all possible. To be a public charity, you have to pass a test, called the public support test. The public support test requires that a certain percentage of the group’s income comes from the general public rather than a few individuals. To be more specific, there are actually two different public support tests: 509(a)(1) and 509(a)(2), defined here. You can use whichever works best for your organization, and you can even ask the IRS to chose for you. That means that the purpose of your organization, as stated in your Articles of Incorporation and Bylaws, has to be for these purposes and these purposes only. For instance, “to provide work space, storage, and other resources for member projects” might include some activities that fall into these eight categories, and some that don’t. A common way to clarify that is to add a section to the bylaws stating “the Corporation shall not carry on any activities not permitted to be carried on by a corporation exempt from federal income tax under Section 501(c)(3) of the Code”. And of course, you have to walk the walk as well. The organization must actually conduct activities to further its tax-exempt purposes. An interesting point here is that even if a group is organized exclusively for tax-exempt purposes, it can serve other purposes incidentally. So if you hold a workshop to teach people to make ice cream (an educational activity) and they get to eat some delicious ice cream in the process (not a tax-exempt purpose) that’s perfectly fine. The IRS also requires that you benefit a charitable class of people rather than a group of specific individuals. For membership organizations like hackerspaces, this seems to be a bit of a gray area. However, the less limitations there are on membership, and the more services that are available to non-members, the easier it will be to meet this requirement. It’s also preferable to have a large and varied board so that the control of the organization isn’t in the hands of a small few. As mentioned above, to be considered a public charity instead of a private foundation, your organization also has to pass one of the public support tests. The more common of the two public support tests is 509(a)(1). As I understand it, this is the test that Noisebridge and Freeside Atlanta used to get their 501(c)(3) status. It requires that one third of your total support comes from the general public: donations, grants, or the government. It also allows you to pass the test if one tenth of your total support is public support, and you meet additional requirements. The definition of “support” is actually rather tricky though. A typical hackerspace receives the majority of its income from dues and classes. Suggested donations for classes and events are public support, but mandatory fees are not. Luckily, fees related to the exempt purpose of the group usually aren’t considered part of total support either, so although they don’t raise the public support fraction, they also don’t lower it. Membership dues are always included in total support, and they count as public support if the member receives nothing of “substantial benefit” in return. So if members receive access to members-only facilities, reduced rates on classes, etc. in exchange for their dues, the dues do not count as public support. Because membership dues are always included in total support, unlike fees for exempt activities, they can actually lower the public support fraction. One common practice is to have some types of “memberships” that are in name only (i.e. not defined in the bylaws) which allows them to be considered fees, and therefore not included in the public support calculation. But, there is an exception to the rule about fees. If “almost all” support comes from fees and an “insignificant” amount of support comes from the public, you can’t use the 509(a)(1) test at all . Luckily, there’s another test you can use if you fall into that category. The lesser known public support test, 509(a)(2), seems promising for hackerspaces that can’t meet the 509(a)(1) test. It’s intended for things like museums that depend on fees from the general public. It also requires that one third of your income is from public support, but for this test, fees received in exchange for products or services do count as long as the products or services are related to the tax-exempt purpose of the group (eg. museum admissions). Furthermore, this can include member dues even when members receive something of value in return (access to member-only facilities, discounts, etc.). So as you can see, very fine distinctions like suggested vs. mandatory donations can have a huge impact on whether your hackerspace meets these tests. There are also some additional restrictions that I haven’t gone into. So it’s probably a good idea to review your bylaws and policies with a CPA specializing in non-profits before even beginning the application. Although the process of getting 501(c)(3) status can seem daunting, several hackerspaces have done it already, and many more are well on their way. If you’ve come across any resources that might help these hackerspaces, please let us know in the comments! And of course, keep an eye out on our blog for updates on our application process and future installments of the Hacker Business Series. Update: Noisebridge has posted some of their 501(c)(3) information, including their application here. (look under the Incorporation section, near the bottom of the page). Lathe, Rinse, Repeat ATTN DIYers: Maker Mixer happens this Saturday, 2pm-6pm.